The Duplicate Mobile phone Market in India - Who is responsible? The Duplicate Mobile phone Market in India – Who is responsible? We have always been witnessing a strategic competition between big ‘cell phone manufacturing’ companies like Nokia, Samsung and Apple to cover large market share, bring emerging technologies and more. But, there is a bigger competitor for them which needs combined attention and action – The duplicate mobile handset market! One of the recent survey revealed that the duplicate market has been growing at a shocking rate of 12% per year in India. This obviously is a bad sign for companies, consumers as well as the government. 2 Who is responsible and what can be done? 2. Poor quality of camera and sound. Although, the well educated citizens generally do not buy such phones, these phones attract crowds who are not aware of the issues / risks involved with such handsets. They look at the cheap price and glitzy large screens and fall for it. Not only the users, but even government is negatively impacted with these phones. These duplicate phones are secretly imported from other countries specifically China, and then assembled and loaded with latest softwares and technology in Delhi. Obviously, they don’t pay any taxes to the government. Who is responsible and what can be done? It is pointless to blame or hold any single party responsible for this illegal trade. Everyone from seller to buyer along with government should be held liable for it. The sellers of duplicate phones are not at all reluctant to sell these products in open market. Is there any deficiency of law against such act? I don’t think so. We have various laws such as Copyright Act to stop such crimes. Its just that our government needs to take some strict actions and by penalizing the involved parties harder. 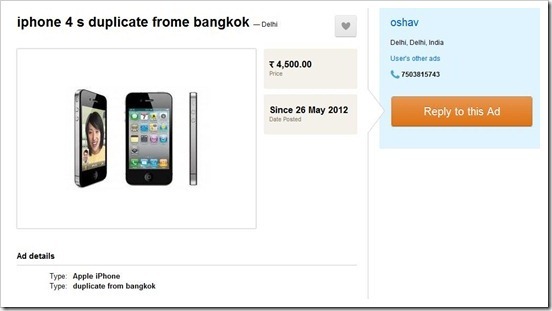 Look at the below advertisement listed on a renowned website to sell Iphone 4S at only Rs 4500!! This is just a small example of this open black market. I think the companies are able to sell duplicate phones only because we are purchasing it. Similar looks of a branded phone at a cheap price is what attracting people. But one should understand the negative aspects too before going for it. 1. Check Actual Bill- Duplicate phone come with a duplicate bill. It is important to check the TAN number on the bill. Also, bill must contain the unique IMEI number of the phone. 3. Mobile box You must check the seal of mobile box that it should not be broken. Read the information on mobile box such as IMEI number, year and place of manufacture, etc. Anything fishy about the product description must be re- considered. I agree that there is a requirement of strict enforcement of laws / regulations by government that should be supported by Indian vendors to fight against this illegal practice. However, I believe this change should begin from us! We should not or stop buying such products even if they look tempting on price. Also, there is a need of a high level of awareness among people to judge between original and duplicate phones. "The Duplicate Mobile phone Market in India - Who is responsible? ", 5 out of 5 based on 2 ratings. Can Sony and HTC Capitalize On the Dual SIM Boom? please dnt buy the duplicate mobhiles. jo itna costly cell phone afford ni kar sakte nd unhe costly cell phone kharidne ka craze hota hai… wai duplicate cell kharidte hai……….. Majority of the peoples eye search for cheap with the same features. If Government thinks it can be eradicated without any import within India and can seize all those without any further sales.But looted and corrupted government will not do this as they get crores and crores of money to sell within India. So people should avoid and be aware from duplicate China made phones..